Linda Radzik. Making Amends: Atonement in Morality, Law, and Politics. Oxford University Press, 2009. Joanna R. Quinn. Reconciliation(s): Transitional Justice in Postconflict Societies. McGill-Queen’s University Press, 2009. Julie McGonegal. Imagining Justice: The Politics of Postcolonial Forgiveness and Reconciliation. McGill-Queen’s University Press, 2009. The three books under review in this essay are united by their concern for justice and reconciliation in the aftermath of conflict and wrongdoing, but each addresses these questions with a unique disciplinary lens. Squarely situated in the field of moral philosophy, Linda Radzik’s Making Amends: Atonement in Morality, Law, and Politics develops a normative response to wrongdoing, providing a comprehensive model for redress. Joanna Quinn’s edited volume, Reconciliation(s): Transitional Justice in Postconflict Societies, takes a social sciences approach, with contributions from both political theorists and political analysts. 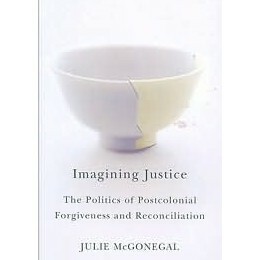 Julie McGonegal’s Imagining Justice: The Politics of Postcolonial Forgiveness and Reconciliation is written from the perspective of literary and postcolonial studies. A summary and critique of some eight hundred pages from such diverse perspectives is no mean feat, but I hope to show the value of considering these questions through very different and sometimes conflicting disciplinary viewpoints. I feel the need to come clean about my own biases. First, my own training and background is in Comparative Literature and I take a Cultural Studies approach to my own research; second, I have just completed a book on forgiveness in literature. For many years now I have been deeply engaged in dialogues around forgiveness and reconciliation, and yet I find myself drawn to explore and learn more. The three books I have chosen to consider here are part of an explosion of publishing in the areas of reconciliation, transitional justice, and conflict resolution. What is most interesting to me is how these conversations have been greatly enriched by the diversity of scholars now working in the fields of philosophy, psychology, political science, sociology, literature, law, and art. In her introduction, Linda Radzik argues that scholarship on conflict resolution has been too narrowly focused on the mechanisms for reconciliation viewed from the perspective of judge or victim, and that the role of the wrongdoer has been neglected. She seeks in Making Amends to fill this gap by establishing what the wrongdoer can do to rectify the wrongdoing, claiming that, “wrongs can be righted and that amends can be made” (3). Radzik first examines the concept of atonement in the discourses of theology, law, and philosophy, then addresses different sources of skepticism, and finally lays out her own model for making amends. Along the way, Radzik refers to specific cases of wrongdoing, from minor wrongs in personal relationships to serious crimes and historic injustices across political and religious communities. She stresses that successful correction of a wrongdoing requires a close examination of the wrongdoing, its consequences, and its symbolic effects. According to Radzik, it is the moral obligation of the wrongdoer to take action and address the harm, even while recognizing that the past cannot be erased and that some damage is irreversible. Such responses include emotions (guilt, remorse, and shame), resolving to improve one’s behaviour in the future, acknowledging the harm done and the accepting blame, apologizing, performing acts of restitution and making reparations, performing good deeds for the benefit of the victim and community, self-punishment, and voluntary submission to punishment at the hands of an authority (5). Historically, atonement has been closely tied to religious notions of redemption, salvation and liberation, but Radzik argues that secular discourses on conflict resolution can benefit from proper attention to the concept of making amends (which she uses interchangeably with atonement). Radzik’s model differs in important ways from the common Christian doctrine, which provides the option of a third-party intervention, where someone else atones for one’s wrongdoing: Jesus Christ atoned for human sin so that all Christians might achieve salvation (8). Radzik outlines three principle objections to atonement: first, that it is purely theological and has no relevance for moral philosophy—the argument that what is done is done and that guilt cannot be washed away; second, that atonement is possible but of no practical value—the wrongdoer is “othered” by his or her acts and cannot be reformed; and third, that the concept of atonement has oppressive tendencies as a form of social control that oppresses people who are already marginalized (9). Here, Radzik introduces a case study that will serve as a platform for much of her deliberations on the concept. The Magdalen asylums of Ireland were institutions where “fallen women” were sent to repent and atone for their past sins, but Radzik suggests that the Magdalen asylums ended up “institutionalizing punishment, not atonement” (17). She maintains nonetheless that this case can teach us about the danger of corruption, whereby figures of authority coerce a wrongdoer into retributive atonement. Only atonement that is taken up by the free will of the wrongdoer is genuine, writes Radzik, admitting that the close connection between atonement and suffering presents a severe obstacle to theories of atonement (19). Having outlined the major tenets of atonement and objections to it, Radzik spends the next three chapters evaluating the three central models of atonement: 1) repayment of a moral debt; 2) moral transformation through atonement; and 3) the relationship between atonement and reconciliation. Of these three, Radzik defends the reconciliation model of atonement, arguing that it is superior because of its focus on repairing relationships for the betterment of all parties: victims, communities, and wrongdoers. While I agree with Radzik in her privileging of the reconciliation model of atonement, I find that her criticisms of the other two models are not strong enough and that she fails to recognize the potential harm in these approaches. There are two ways of amending a moral debt, the “retributive model,” whereby the wrongdoer must suffer for his or her actions, and the “restitutive model,” whereby the wrongdoer compensates the victim in some way. Radzik concludes that these models are necessary but not sufficient because the retributive model elides the victim and the restitutive model fails to acknowledge the wrongdoer’s role in making amends. Radzik suggests that guilt, remorse, and shame are useful emotional responses (37), although she admits that apology and restitution are “usually more effective than the pursuit of suffering per se” (44, my emphasis). She concludes that “repentance is valuable and wrongdoers must repent, yet repentance is not sufficient for atonement” (71). Radzik’s arguments in favour of repairing relationships (introducing the wordplay on atonement as at-one-ment) are more convincing than her skepticism around retributive approaches, and her emphasis on the elimination or annulling of a wrongdoing precludes the possibility of atonement as an on-going process. The three final chapters of Making Amends—on forgiveness, restorative justice, and group atonement—bring fresh insights to debates that have not received much attention from philosophers. In her discussion of restorative justice, Radzik argues in favour of this system because it gives a more active role to the wrongdoer, but she worries, and rightly so, that restorative justice “violates the principle of liberal neutrality” because the state finds itself in a battle over competing conceptions of what is good. For the sake of the community, Radzik writes, the state needs to remain dispassionate, concerned only about the violation of the law rather than the consequences for either the wrongdoer or the victim. In her final chapter on group wrongdoings, Radzik returns to the case of the Magdalen asylums, arguing that the current members of the church have a moral responsibility to rectify the wrongs committed by previous generations, and that the Catholic Church must find appropriate ways of making amends, be it through acknowledgement, apology, or memorials. I have concerns about two aspects of Radzik’s study: first, the emphasis on guilt and shame as part and parcel of making amends, and second the lack of context with regard to culture, history, religion, ethnicity, or gender. In my view, Radzik does not adequately acknowledge the cultural-historical specificity of Irish Catholoicism or the intersections of gender and power in her case study of the Magdalen asylums. That said, Radzik deserves credit for drawing scholarly attention to the neglect of wrongdoers in the reconciliation process. In recent decades, victims rights groups have lobbied hard for their increased presence in courtrooms and the media, and victim status has taken on a dangerous moral and rhetorical authority. Radzik’s focus on atonement restores the role of wrongdoers as active agents in the process of conflict resolution. We turn now from the private world of the wrongdoer to the public realm of communities. We also shift from the personal to the political. Where Radzik’s study looks at a tightly controlled microcosm of damage and repair, Joanna Quinn’s edited volume, Reconciliation(s): Transitional Justice in Postconflict Societies, shows us a very messy picture indeed. In her introduction, she acknowledges the complexities and contradictions inherent in real-world situations, with large groups, multiple parties and often centuries of history, and seeks to mitigate the confusion by outlining various methodological frameworks and clearing up terminology. Quinn points out that the term “transitional justice,” which refers to the transformation of conflict and post-conflict societies, has only been around for a decade or so, and that there is therefore little in the way of a standard body of literature. Scholars from disciplines throughout the social sciences, law, and the humanities have developed different models and various thematic foci. Quinn divides reconciliation studies into four subfields (albeit acknowledging that the lines between these are necessarily blurred): 1) memory and remembering; 2) truth and truth-telling; 3) peace-building and the transformation of institutions; and 4) forgiveness. Moreover, she identifies three urgent concerns for the discipline: the problem of developing a working definition of reconciliation; the divide between process-oriented and outcomes-based models; and the distinction between individual and community-based reconciliation. Quinn acknowledges the wide variety of approaches taken in the volume, but divides them roughly into theoretical and case-based studies, some employing political-legal frameworks and others using applied analysis. All of the articles in the volume, however, address some aspect of social healing, the process by which communities are built and relationships are repaired for the mutual benefit of all parties. Rather than treat each chapter, I will highlight a few key contributions and refer generally to others along the way, but first I’ll introduce some of the theoretical models. The first part of the volume focuses on processes of reconciliation, with emphasis on acknowledgement, repentance, and forgiveness. Where some theologians and philosophers see forgiveness as a category unto itself that ought not to be contaminated by politics, negotiations, or conditions, the authors in this volume generally take a more pragmatic approach, such as Lawrence Thomas’s view of forgiveness as a dialectic relationship, where forgiveness functions like an exchange and compensates for a wrong (7). Using peace processes in Northern Ireland as a reference point, Nicholas Frayling also sees forgiveness as a means to an end, replacing the adage of “forgive and forget” with “remember and repent” (29), and stressing the importance of examining the historical record as a means to stop historical abuse and hatred. For her part, Trudy Govier emphasizes acknowledgement—admitting the wrong and recognizing the harm it caused—as a necessary first step toward achieving sustainable peace (37-38). Like Radzik, Govier argues that the perpetrator has a key role to play, and that atonement, restitution, and reparation are central to successful reconciliation. Part two of the volume is devoted to diverse case studies, for example Morocco’s Fairness and Reconciliation Commission, the Guatemalan Commission for Historical Clarification, and Northern Ireland’s mixed-religion schools. I’ve chosen to look at Rosemary Nagi’s “Traditional Justice and Legal Pluralism in Transitional Context: The Case of Rwanda’s Gacaca Courts” in more detail because it focuses on traditional justice as a subcategory of transitional justice, and asks important questions about the intersections of indigenous custom and human rights law. Nagi points to the United Nation’s warnings against imposing a universal model of justice, especially in the developing world and post-colonial societies. While human rights law and the International Criminal Court are undoubtedly important tools, there is considerable tension between internationalized concepts of truth, justice, and reconciliation and local traditions of conflict resolution. Local and customary law has come to play an increasingly important role in regions such as Sierra Leone, East Timor, and Northern Uganda, and Nagi argues in favour of legal pluralism, which she defines as “the interaction between an internationalized transitional justice based on universal human rights and locally based transitional mechanisms based on customary law” (87). She stresses the need for a combination of global and local approaches that are “attuned to issues of legality and power” (87). In post-genocide Rwanda, there were three different levels of transitional justice: the International Criminal Tribunal for Rwanda (ICTR), criminal trials at the national level, and the gacaca process. Gacaca courts were established in 2001 as a response to the two major failings of “Western” justice: the time-consuming strictures of due process (with more than 120,000 people in prison, time was of the essence), and the lack of culturally sensitive approaches. With more than 12,000 courts throughout Rwanda, the gacaca system remains the main venue dedicated to justice and reconciliation. Nagi warns, however, against romanticized notions of authentic tradition, which stereotypes African people as outside “universal” Western notions of justice, and instead endorses Bonaventura de Sousa Santos’s idea of “interlegality” as a hybridization of legal orders (88). That said, Nagi also emphasizes the need for active critique of gacaca-like systems, specifically the lack of legal representation and poor accountability. She is also skeptical of the Rwandan government’s position, which denies the existence of tribal categories (Hutu, Tutsi, and Twa), all the while quietly “Tutsifying” the judicial system. While gacaca has introduced respect for local cultures, there is skepticism among the international community that it can achieve the goals of truth, justice, and reconciliation, to say nothing of security and a strong rule of law. Nagi concludes by reminding her readers that, whether Western or African, global or local, the law is never neutral: “The contextual sensitivity upon which support for gacaca appears to rest cannot be abstracted from the socio-political dynamics of power either across or within normative-legal orders” (106). Stephanus F. Du Toit’s “Tensions Between Human Rights and the Politics of Reconciliation: A South African Study” picks up on similar themes. A great deal has been written about the South African Truth and Reconciliation Commission (TRC), but the scholarship has tended to privilege a Human Rights perspective. By broadening the approach, Du Toit provides valuable new insight into the complex tensions between justice and peace, human rights and reconciliation, victims’ rights and perpetrator demands, and legal processes and extrajudicial truth-seeking mechanisms (232). There were also largely unspoken tensions between competing models: legal (amnesty for criminals in exchange for full disclosure), religious (Bishop Desmond Tutu’s call to forgive), and political (reconciliation as the means to create the Rainbow Nation). All of this took place under intense media scrutiny, with the aim of exposing the truth to the wider South African population and the world. But these are not the only competing models. Du Toit outlines five concurrent notions of human rights: 1) President Mandela’s “colour-blind promise,” which proposed to transcend racism and turn reconciliation into policy; 2) F.W. De Klerk’s claim to cultural self-determination of the Afrikaans community, which had historically been discriminated against by the British; 3) the conundrum that religious groups such as the African Christian Democratic Party only acknowledge the human rights that coincide with Christian morality, which compromises gay rights, access to abortion, and protection for prostitutes; 4) Thabo Mbeki’s new interpretation of human rights, which acknowledges the colonial history of racial oppression and emphasizes the importance of cultural and ethnic specificity; and 5) the version of human rights that takes into account poverty and class oppression as major determining factors that limit equality and human dignity. The major contribution of Du Toit’s article is to draw attention to the ambiguities and contradictions around human rights, and the roles of politics, race, religion, culture, ethnicity, and class. With the fading of the post-apartheid era, it is crucial to reevaluate the legal and moral assumptions surrounding human rights, and to add valuable new context to these frameworks. The final essay in this volume, Brandon Hamber and Gráinne Kelly’s “Beyond Coexistence: Towards a Working Definition of Reconciliation,” continues the discussion of terminology and frameworks initiated by Quinn in her introduction. The authors consider the history of reconciliation processes, which gained momentum in the 1990s when several international peace processes got under way. They define reconciliation as “developing a mutual conciliatory accommodation between antagonistic or formerly antagonistic persons or groups,” the core of which “is the preparedness of people to anticipate a shared future” (287), but they stress the need for the distinction between reconciliation and forgiveness, because of the latter’s association with religious practices such as confession, repentance, restitution, and redemption, which they say can undermine justice. Reconciliation, Hamber and Kelly argue, demands that the perpetrator acknowledge the wrong and make amends, where forgiveness is not necessarily dependent on such conditions. Furthermore, when reconciliation is conflated with calls to forgive and forget, there is a danger that wrongs of the past will be concealed or, worse yet, denied. Reconciliation, they say, is not a religious concept, but an expansive, complex, and difficult process of unearthing an often traumatic and violent past with the goal of peaceful coexistence. 1) Developing a shared vision of an interdependent and fair society. 2) Acknowledging and dealing with the past. 4) Significant cultural and attitudinal change. 5) Substantial social, economic, and political change. Interviews on the subject of successful reconciliation revealed that “acknowledging and dealing with the past was, by a large margin, the aspect that respondents gave most emphasis” (299), which supports Linda Radzik’s claim that atonement—including acknowledgement and redress—deserves to receive more attention in discourses on conflict resolution. Julie McGonegal’s Imagining Justice: The Politics of Postcolonial Forgiveness and Reconciliation charts new territory by bringing postcolonial theory and discourses on reconciliation into dialogue with literary studies. While postcolonial approaches have been prevalent in the study of fictional narrative since the 1990s, research on forgiveness, reconciliation, and transitional justice has not been widely addressed in literary studies. McGonegal begins by drawing attention to the myriad of public apologies in recent years, not least of which Canada’s apology to aboriginal survivors of residential schools. This landmark step was preceded by apologies to Japanese Canadians, Italian Canadians, Ukrainian Canadians, Croatian Canadians, Chinese Canadians and Jewish Canadians, all of whom had been the victims of historical wrongs. Wole Soyinka has called this a “fin de millénaire fever of atonement” (x); by contrast, Globe and Mail writer Jeffrey Simpson bemoans the “pervasive culture of victimization,” and says that we need to stop the special treatment for ethnic and religious minorities or the “victimization competition” will divide us into a “dangerously pluralistic society” (xii). McGonegal’s preface speaks precisely to such paradoxes of reconciliation that Quinn’s volume identifies. In recognizing the wrongs done to victims, we end up encouraging identification with victim status and the rhetorical authority it engenders. That said, even if these many apologies appear repetitive, they generate both real and symbolic meaning for the affected peoples. McGonegal explores these questions in fictional narrative from a wide variety of cultural contexts, including Australia, Sri Lanka, Canada, and South Africa. She is at pains to demonstrate that literature is not just a tool for analysis, but that it has a vital role to play in engaging the imagination and offering creative perspectives on age-old conflicts, citing Peter Hallward’s critique that postcolonial readings have tended to be mere anecdotal props to back up complex theoretical claims. McGonegal joins Gayatri Spivak in championing the aesthetic power of literature to transform entrenched political debates, and writes: “What forgiveness and literary activity share, then, is an act of submission, an act of risk-taking insofar as one opens oneself up to the possibilities brought into existence by the fact of contact with another person” (11). McGonegal is careful, however, to point to the limits of reconciliation, saying that fiction is not an “eminent expression of forgiveness and reconciliation,” but that it inspires creative thinking about conflict, draws our attention to new possibilities, and “supplements the public address of grievance and pain” (14). The other significant danger, McGonegal warns, comes from using novels—especially those written by privileged white males of postcolonial nations—as representative or authentic and as a means to elaborate a politics of reconciliation. Perhaps the most ambitious aspect of McGonegal’s study is her attempt to map out a theory of postcolonial forgiveness and reconciliation. As her starting point, she juxtaposes two giants of twentieth-century thought, Franz Fanon and Mahatma Gandhi. Where Fanon’s Sartrean existentialism insists that no conciliation is possible, Ghandi’s position of nonviolence is born out of a metaphysical belief in the power of “suffering love” as a means to transform politics. Without the purgatory affect of violence, warns Fanon, the colonized remains fixed in a condition of melancholy apathy. Where Gandhi views reconciliation as an ethical imperative, for Fanon it is undesirable and impossible. Nonetheless, McGonegal argues that when read in tandem, Fanon and Gandhi’s thought “helps to develop a dialectics of reconciliation methodologically and conceptually attuned to the principles of community” (27). Citing Edward Said’s call for colonized groups to end the “politics of blame” and for the West to take responsibility for its past wrongdoings, McGonegal suggests that postcolonialism can function as Homi Bhabha’s “third space,” to “facilitate cross-cultural conversation between radically different ideologies” (29). Defining reconciliation as “the establishment of new conditions and interactions—conditions centred on the ideals of negotiation, collaboration, and reciprocity” (33), McGonegal argues that practices of reconciliation can constitute alternatives to modern conceptualizations of justice (34). She is careful to add, however, that justice must be included within reconciliation and that these notions of justice must not be based solely on Western models. Furthermore, this reconciliation can operate in the ambiguous space “between the singular and the universal, as moving dialectically between the subjective and the social” (38). McGonegal moves from ambiguity to paradox in the work of Jacques Derrida, who maintains that pure forgiveness must be free of conditions, that it cannot have an agenda or be conflated with atonement. That said, Derrida admits that he is torn “between a ‘hyperbolic’ ethical vision of forgiveness, pure forgiveness, and the reality of a society at work in pragmatic processes of reconciliation” (qtd. in McGonegal 43). McGonegal finds inspiration in Derrida’s claim that it is in the negotiation between these two poles that “responsible political action and decision-making occur” (43), but supplements this position by invoking Kristeva’s definition of forgiveness as an interpretation that avoids rational reconstructions of wrongdoing and thereby opens up the possibility of moving beyond both the wrong and the blame and hatred it engenders. Finally, McGonegal brings Kelly Oliver’s concept of social forgiveness into conversation with Derrida and Kristeva, praising her for recognizing that “social forgiveness is not a question of forgiving unforgivable crimes but of forging the deprivation of agency that renders forgiveness impossible” (49). McGonegal suggests that for Oliver, forgiveness is not about individual wrongdoings, but rather it entails forgiving the transgression that is singularity and individuality, and that it is about “restoring the definitive feature of subjectivity—forgiveness—to the victims” (49). McGonegal adopts Oliver’s vision that forgiveness functions as a product of intersubjectivity and collectivity. This concept of intersubjective forgiveness is the key to McGonegal’s postcolonial forgiveness because it “necessitates discarding our prejudices against forgiveness as inward, private, belonging to the cult of feeling, and thus non-political and inapplicable to collective aims or identity” (50). The brilliance of her claim here is that she not only marries postcolonial aims to those of reconciliation, but also disarms the critique that forgiveness applies only to individual or interpersonal situations. Further, McGonegal likens this collective, intersubjective forgiveness to the cultural specificity of ubuntu, the African ethics of interdependent humanity espoused by Bishop Desmond Tutu as the core value of the Truth and Reconciliation Commission. Each of the four subsequent chapters functions as a case study to explore a different aspect of reconciliation and forgiveness, mapping competing notions of justice onto a literary text. David Malouf’s Remembering Babylon (1993), which treats the historic wrongs suffered by Australia’s Aborigines, serves as a platform to explore the problematic nature of politics that represses or elides the difference of the other. This chapter demonstrates the necessity of culturally sensitive approaches to reconciliation, especially where indigenous peoples are concerned, and the dangers of embarking on such a project without the crucial phases of acknowledgement and atonement stressed by both Quinn and Radzik. Despite its sobering perspective, McGonegal concludes that Malouf’s novel nonetheless constitutes “a refusal to give up on the task of radically transforming racial relations in Australia” (20). Michael Ondaatje’s Anil’s Ghost (1999) presents similarly recalcitrant ethnic strife. If nothing else, Ondaatje exposes the senseless loss wrought by the endless cycle of violence and thus presents a damning critique of both the parties involved in the conflict and international policy makers, the United Nations, human rights organizations, and the United States. Like Quinn, McGonegal demonstrates that culturally appropriate means are crucial to the outcomes of peace interventions. Ondaatje questions the assumptions around principles of legal judgment and prosecution as well as the dogmatic insistence upon retribution on all sides. McGonegal locates in Anil’s Ghost an ethics of caring for the other, established through the novel’s archeological excavation of fragments and remains, both physical and emotional, that “constitute powerful forms of resistance, recomposition, and reflection” (21). With Joy Kagawa’s Obasan (1981), McGonegal pursues the important connection between forgiveness and remembrance. While forgetfulness, amnesia, and repression might be convenient for Canadians wishing to distance themselves from an embarrassing national past, the novel demonstrates that forgiveness necessitates a renarration of past injustices. McGonegal points to Obasan as an example of the real-world implications of fiction—the novel’s exposure of the internment of Japanese Canadians during World War II raised consciousness among survivors, transformed public perceptions of this injustice, and may have influenced the Canadian government’s decision in 1988 to offer an official apology and pay reparations to individuals affected by this historic wrongdoing. McGonegal’s final example, J.M. Coetzee’s Disgrace (1999), exposes the shortcomings and contradictions of truth-telling and confessional discourses in South Africa’s national reconciliation project. Written in part as a response to naïve Western enthusiasm for the Truth and Reconciliation Commission, Coetzee’s tale of sexual harassment and white middle-class guilt weighs the potential dangers and benefits of confessional rituals, but more importantly the novel grapples with complex power relations of forgiveness. McGonegal demonstrates the ways in which Disgrace asks important questions about how pressure to forgive further marginalizes the oppressed by placing the burden of reconciliation on their shoulders. The white woman who is the victim of sexual harassment acts as a foil for the masses of black South Africans who were asked by their own leaders and by the international community to forgive before proper measures had been taken to recognize and redress the wrongdoing. Again here, Radzik’s and Quinn’s concern for acknowledgement and making amends come to mind. We are confronted yet again by the paradox that the victim can either have too much power to grant or deny forgiveness, identifying with the rhetorical authority gained through suffering and oppression, or victims can end up internalizing their marginalized position, succumbing to coercive pressures for blanket forgiveness from the very people who were responsible for their oppression and suffering. McGonegal’s task as a critic is to demonstrate how literary works can provide a means to explore the balanced approach, what she optimistically calls “forgiveness without power” (22). McGonegal provides lucid discussion of theoretical models and fictional works, weaving disparate discourses into coherent arguments with ease. I can find little to quibble with in this fine study, but I do wonder about the unique focus on contemporary literary works (with the exception of Kagawa’s Obasan, all examples are taken from the 1990s), the paucity of formal analysis of texts, and the fact that McGonegal treats Australia’s Aborigines but says little of Canada’s indigenous peoples. That said, Imagining Justice is groundbreaking in its focus on bringing together the fields of postcolonialism, theories of conflict resolution, and literary studies. In conclusion, I observe that, taken together, the three books under review mark a turning point in reconciliation studies. The fact that Radzik, Quinn, and McGonegal each explore a subset of the discipline—atonement, transitional justice, and postcolonial reconciliation—is a sign that the field of conflict resolution is beginning to mature. These are not introductory works, but rather they ask nuanced questions about the mechanisms and methodologies of reconciliation, and collectively raise the level of scholarship by reflecting upon, questioning, and supplementing the values, assumptions, and arguments already in place. If there is a trend, I would say it is the attention to the dangers of hasty reconciliation and the potential damage to victims, thus the strong focus on the conditions for reconciliation: acknowledgement, apology, confession, restitution, reparation, and other forms of redress. Another central concern is the call for culturally appropriate mechanisms of reconciliation, not to pit indigenous forms of justice against international human rights discourses but rather to foster fruitful dialogue between traditional and Western forms of justice. Further themes are the omnipresence of paradox, the recognition that reconciliation never happens outside of power structures and politics, and the importance of narrative and fiction as means to mediate trauma and imagine creative alternatives to entrenched conflict. There has been an explosion of scholarly writing on forgiveness and reconciliation, and there is no doubt that these studies contribute in important ways to these debates, but that the conversation needs to continue, for as Thich Nhat Hanh has said, “the practice of peace and reconciliation is one of the most vital and artistic of human actions” (47). Jill Scott. A Poetics of Forgiveness: Cultural Responses to Loss and Wrongdoing. New York: Palgrave, 2010. It is interesting to note that this list is similar to the kinds of conditions placed on normative forgiveness (see Charles Griswold’s Forgiveness: A Philosopical Exploration. Cambridge: Cambridge University Press, 2007). While atonement is subsumed as a subset of forgiveness for Griswold, Radzik gives it priority over other features. See Pumla Gobodo-Madikizela’s “Remorse, Forgiveness, and Rehumanization: Stories from South Africa.” Journal of Humanistic Psychology 42.1 (2002): 7–32. See for example Jacques Derrida’s “On Forgiveness.” On Cosmopolitanism and Forgiveness. London: Routledge, 2001. While the South African TRC elicited a number of important conversations around transitional justice in relation to literary studies (see Rosemary Jolly’s Cultured Violence: Narrative, Social Suffering and Engendering Violence in Contemporary South Africa (Chicago: University of Chicago Press, 2010)), there has been little direct treatment of literary representations of forgiveness or theorizing of forgiveness through literature. Thich Nhat Hanh. Peace Is Every Step: The Path of Mindfulness in Everyday Life. Toronto: Bantam, 1992. Jill Scott is Associate Professor and Head of the Department of German at Queen’s University. She is the author of A Poetics of Forgiveness: Cultural Responses to Loss and Wrongdoing (New York: Palgrave, 2010) and Electra after Freud: Myth and Culture (Ithaca: Cornell University Press, 2005). Her current research is in the areas of Conflict Resolution, Forgiveness Studies, and Transitional and Restorative Justice.